art ‘space’ of peace and calm. Billy Chestnut: “I am a Gooniyandi man, my bush name is Ngoowarl. 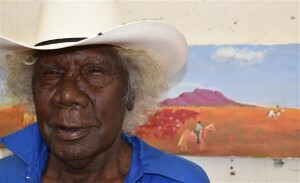 My wife is a Walmajarri woman, April Thirkall, her father was an artist at Mangkaja – Willy Kew. I have kids who live in Perth and Roebourne and a growing number of grandchildren. I was born at Chestnut bore on Christmas Creek Station. I grew up there it was a little colony and roadhouse between Halls Creek and Derby. A road used to go through there,that was in the depression days, just a gravel road, no bitumen. I went to school at Outcamp Creek on Go Go Station. My father worked on the station and my mother and family were all there on Outcamp Creek. In 1957 we moved to Go Go station and went to school in a cave, starting the 27th August 1957. It wasn’t air-conditioned but it was cool underneath. The bloke who ran it was a Christian. He taught ways of the Lord and Sunday school. We got an education as well, it was two ways; Christianity and normal education. I attended a boys school in Perth and learnt to speak standard English at the very least and mathematics – to count properly. I went on to South Hedland as well to get more education. Kardiya used to use silly language that no one could understand, so I learnt those words. The best thing was getting more education in English and maths at South Hedland, that was a time I liked most. In 1964 I started working on GoGo station. I’ve worked hard all my life. I learnt to do horse riding, mustering and droving cattle. Ngalingkadji is where I live now, I worked on the school bus there for four or five years until I had to have shoulder surgery on both my shoulders a couple of years ago. I started painting a couple of years ago. I came to Mangkaja Arts because I wanted to draw my dreaming, the dreamtime and create some artwork about station life. I like to share the stories from my country, there are cave drawings at Home Range Spring, I’ve painted those drawings in some of my work. And shown station mustering stories in other paintings. Cave Paintings , Gooniyandi Dreaming Spirits of Home Range Springs, Station Histories, Gooniyandi Country. Jonian Ivy Nargoodah is the oldest sibling of nine in the Nargoodah family and is a mother herself. She is one of the many artists from this important family of artists in the Fitzroy Valley. Ivy is taking her families many artistic skills in painting and printing into new areas and developing her own social enterprise in textile development called Rukaji Designs. She is a prolific textile artist who is slowly building her product lines. She is known for skilled hand printed lino block on cotton, which she now creates as table cloths, cushion covers and is moving into clothing design. Ivy is a skilled fabric artist and has developed her skills in working with silks. 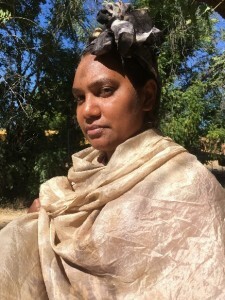 She dyes silks with natural plants and bush medicines she finds in her community of Jimbalakudunj – 100kms from Fitzroy Crossing. There she boils up her dyes and wraps her silks in rusted items she finds to create unique and beautiful art pieces with silk and has started testing this process with other fabrics. Ivy is building her career and reputation and looks forward to furthering her skills in textiles and fashion. 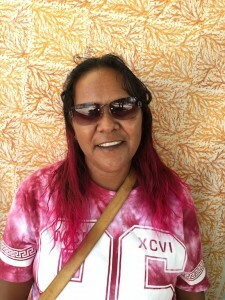 She has partnered with fashion houses in Sydney and Melbourne to gain professional development skills and engaged in workshops at Marninwantikura Women’s Centre in Fitzroy Crossing. Ivy aims to teach her younger family members and young women of the Fitzroy Valley the skills in silk dying and block printing to give them something positive and cultural enriching to engage with and to earn income and learn business skills for when they finish school. She also runs workshops with school groups and tourist groups sharing her skills and expertise. Margaret Albert is a Nyul Nyul/Bardi Jawi woman living in Jimbalagudunj in the Kimberley of Western Australia. She has one son and is married to Navarone Nargoodah. She is also daughter-in-law to master bush dyer Eva Nargoodah. Margi makes bush dyed scarves and seed and bead jewellery. When she goes fishing or for a walk, she collects barks and seeds from the local landscape to make beautiful artworks. She is learning block print and screen printing from Jonian Ivy Nargoodah, her sister-in-law, to expand her art practice. She enjoys keeping busy and gaining experience, working in her personal art ‘space’ of peace and calm.